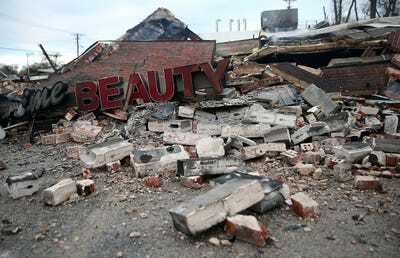 Justin Sullivan/GettyA sign sits amidst rubble at a building that was damaged during a demonstration on November 25, 2014 in Dellwood, Missouri. Protests erupted in Ferguson, Missouri, last night following the decision by a grand jury to not indict police officer Darren Wilson, who shot and killed unarmed 18-year-old Michael Brown in August. Authorities published Wilson’s grand jury testimony and photos of his injuries following the decision. About 25 buildings were set on fire in a wave of civil unrest, and CNN reports that several flames were still burning as of 6 a.m. ET on Tuesday. After the crowd heard the prosecutor announcement of the grand jury’s decision via radio and phone, a portion of the crowd sprinted towards a barricade in front of the Ferguson police headquarters, according to the Washington Post. The protesters hurled water bottles at the officers who blocked them with plastic shields. It wasn’t long before the scene turned to chaos as the protesters were divided by those demonstrating peacefully and others tuned to violence. Police fired tear gas and rubber bullets. 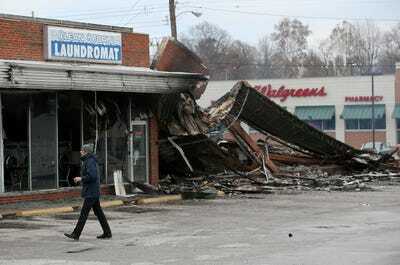 Numerous businesses and buildings were destroyed or broken into, with some being looted. 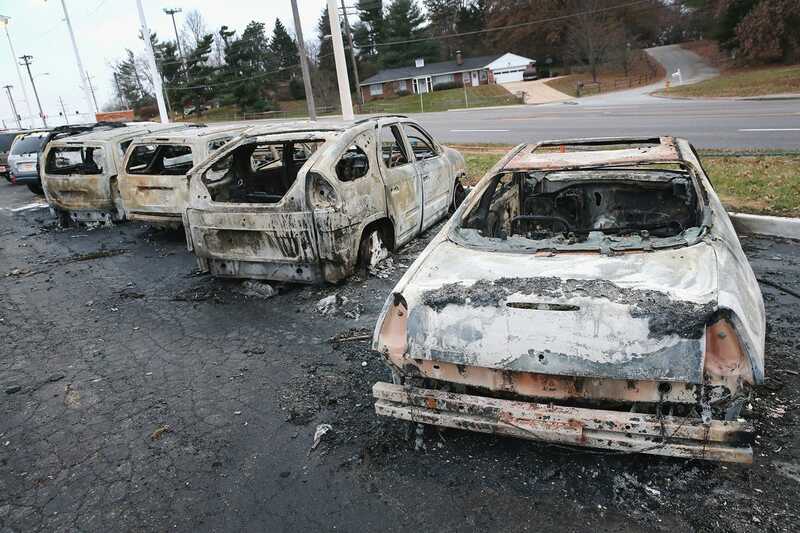 At least two police cars were burned. REUTERS/Jim YoungA police car burns on the street after a grand jury returned no indictment in the shooting of Michael Brown in Ferguson, Missouri November 24, 2014. 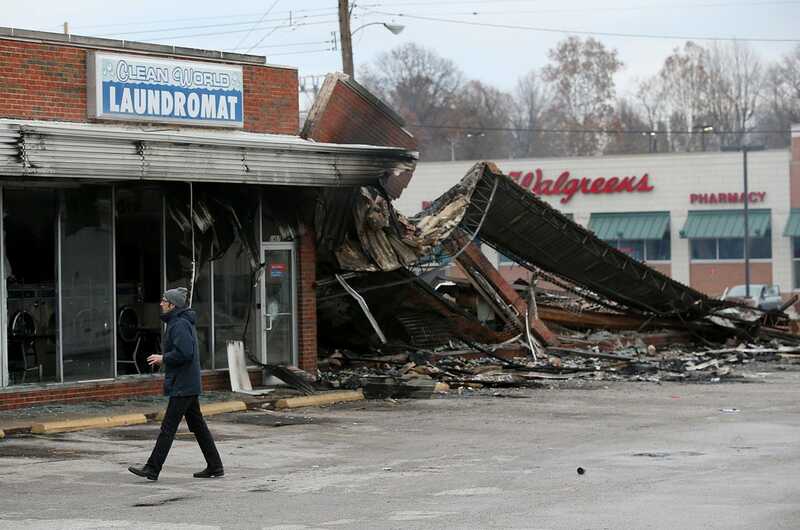 St. Louis County Police Chief Jon Belmar also said he personally had heard about 150 gunshots fired during a night of looting, arson, and clashes between demonstrators and police. 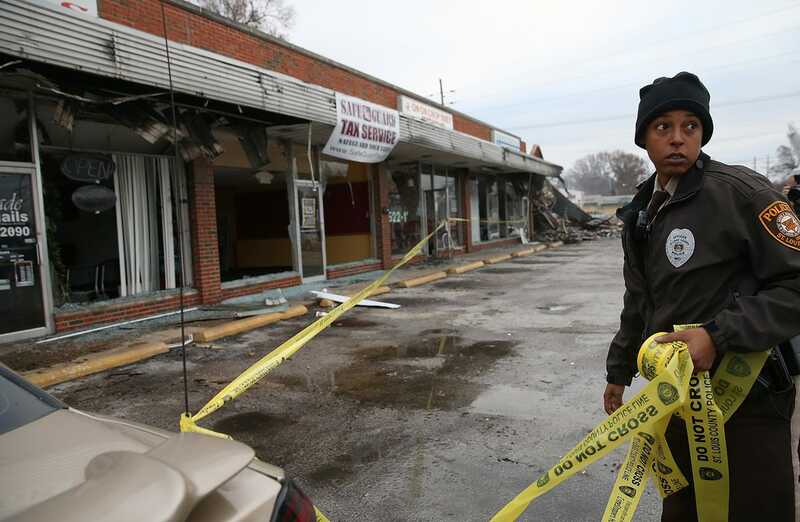 After the night of chaos, those in Ferguson and St. Louis paused to take stock of the destruction. 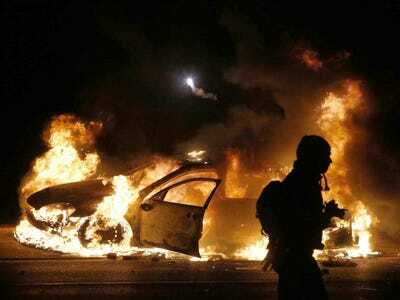 At least 61 people have been arrested in the area overnight after the protests grew violent. According to Al Jazeera, arrest records indicated that the charges included burglary, trespassing, and unlawful possession of a firearm. In addition to the Ferguson arrests, there were 21 arrests in St. Louis. At least 14 people were injured during the protests, according to the AP. 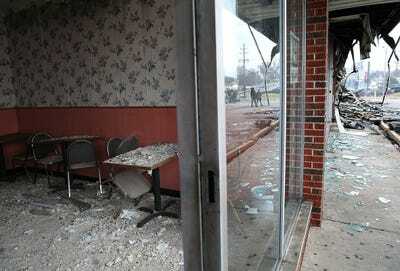 Here are some photos of the aftermath in Ferguson and the St. Louis-area. 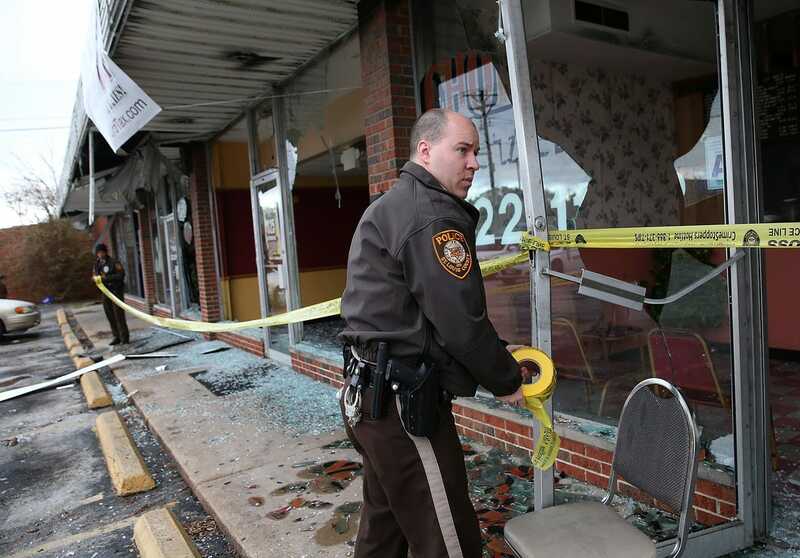 Justin Sullivan/GettyTables sit covered with debris in a restaurant that was damaged during a demonstration on November 25, 2014 in Dellwood, Missouri. 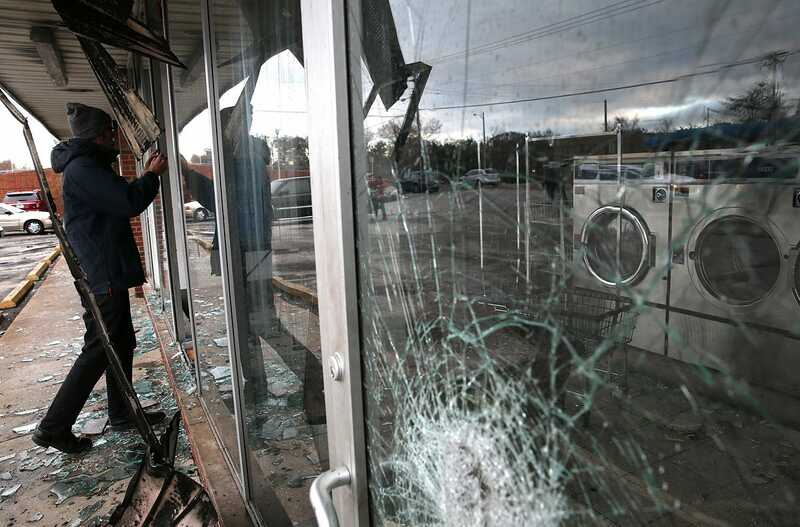 Justin Sullivan/GettyA reporter walks by a building that was damaged during a demonstration on November 25, 2014 in Dellwood, Missouri. Justin Sullivan/GettyA St. Louis county police officer uses police tape to secure a building that was burned during a demonstration on November 25, 2014 in Dellwood, Missouri. Justin Sullivan/GettyCars which were set on fire when rioting erupted following the grand jury announcement in the Michael Brown case sit on a lot on November 25, 2014 in Dellword Missouri. 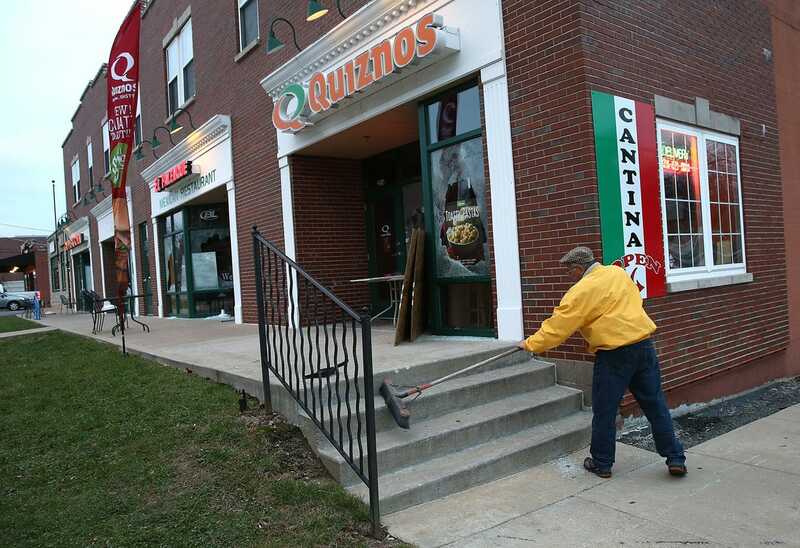 Justin Sullivan/GettyA worker cleans up glass outside of a Quiznos restaurant that was damaged during a demonstration on November 25, 2014 in Ferguson, Missouri. Justin Sullivan/GettyA St. Louis county police officer uses police tape to secure a building that eas burned during a demonstration on November 25, 2014 in Dellwood, Missouri. 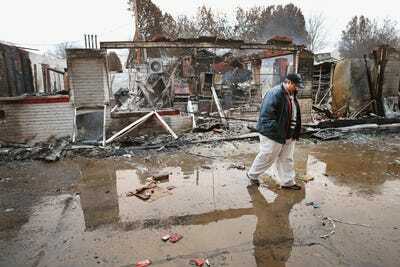 Justin Sullivan/GettyProperty manager Terri Willits looks over a gas station she manages that was set on fire when rioting erupted following the grand jury announcement in the Michael Brown case on November 25, 2014 in Dellword Missouri. Justin Sullivan/GettyA reporter looks through the window of a laundromat that was damaged during a demonstration on November 25, 2014 in Dellwood, Missouri. 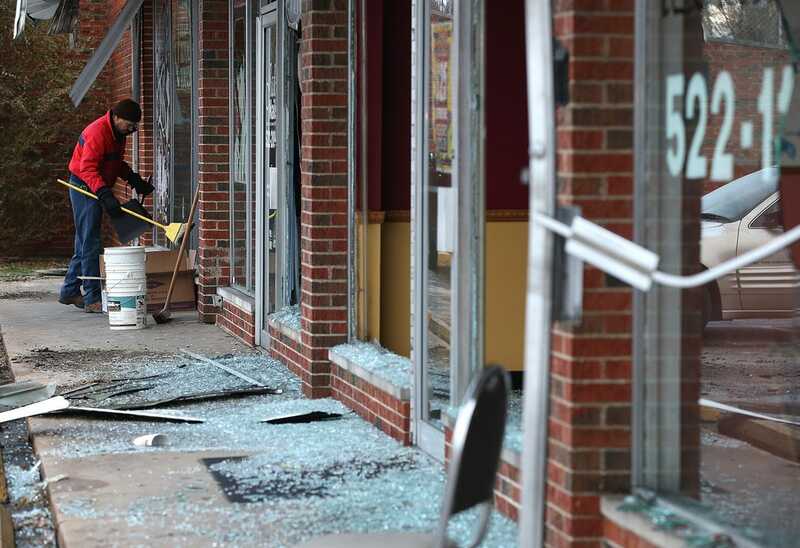 Justin Sullivan/GettyA worker cleans up glass at a building that was damaged during a demonstration on November 25, 2014 in Dellwood, Missouri.